We had stayed up rather late, enjoying Erik’s birthday and explaining things like “Juice” and “Barter Town” to young Caleb, who didn’t understand the Mad Max movie plots at all—he thinks that post-Apocalyptic means zombies. So when we retired for the night, we left the camp in a bit of disarray. I knew that my camera was out, and maybe some other things, so I scrambled down the ladder from the roof-top tent to grab things that I shouldn’t have left out in the rain. I grabbed the camera and looked up at the sky, seeking a dead-of-night weather report and fearing the worst. Far above us I expected to see clouds accumulating across the western crest of the Lake Tahoe basin. Instead, I saw stars, which didn’t make any sense. I looked down—the ground was almost dry. That didn’t make any sense either. Then I realized, that what I had heard was the dew falling on the fiberglass roof of my AutoHome tent. So I went back up to bed and… never fell back to sleep. The mind is powerful. It can help you do things you’ve never done before and it can keep you from doing things you do all the time, like falling asleep. I tossed and turned, and drove up Cadillac Hill for the first time more than a hundred times, never once getting it right: body damage every single time. Finally, I just resigned myself to getting no sleep and worried instead about the bear that was seen a while back, and the tire pressure I should run, and how long it would take us to get out, and whether we would we have to winch, and, and, and… So I waited for just enough light, started to pack the truck, tied things down, and made some coffee. The others woke up after a while and, after a quick breakfast, we hit the trail. I could tell that we were all nervous. We’d asked almost everyone we’d spoken with so far, “How bad is Cadillac Hill?” and had gotten lots of different answers. Nobody except the buggy drivers liked it very much. By then we were fearing it. It loomed larger than any thing else we had expected to worry about on the trail. You could bypass the Little Sluice—we did. You could bypass the Old Big Sluice and take Indian Trail—we did that too. We didn’t have any idea how rough going around Buck Island lake was going to be or how tough the Big Sluice was going to be, so we didn’t have a chance to worry about them. Cadillac Hill was our worst fear. We thought that we had gotten of to an early start, but that wasn’t the case. By the time we passed the graveyard and headed up on to the slabs, we began to run into traffic. Approaching Cadillac Hill you pass a small graveyard on the right, that makes you think twice (or three times), but I don’t think that anyone is really buried there. Next, you climb up onto some steep granite slabs and into the forest. Once you go into the trees you pass through through a couple of very narrow spots, that, unless you can climb over, you had better watch your line. After making a right-hand switchback, which is the start of the crux of the whole hill, a long stretch of steep, nasty, dusty, sometimes narrow, sometimes off-camber, but never dull, switchback that aims you at the morning sun. Relentless. This first corner is very steep, but not as steep as things will get. 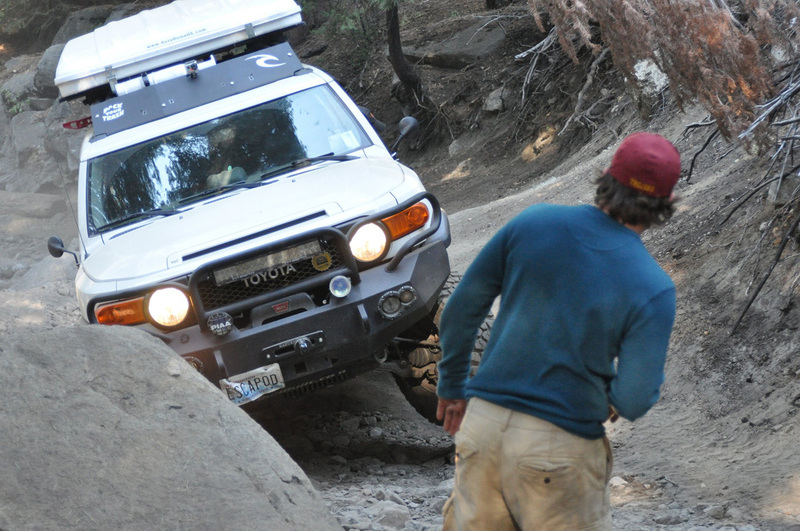 You need to aim to put your passenger side rear wheel on a well rounded stone mound, in the middle of the turn, as you come around (as Erik demonstrates in the photograph). I failed to do that and took the corner too wide. Remember this picture: this is the correct line! I went too far left, listening to voices in my head, and went up onto my two, passenger-side wheels, which, if you’ve never done it before, really clears you head. You are here—NOW!—living in the moment, so to speak. 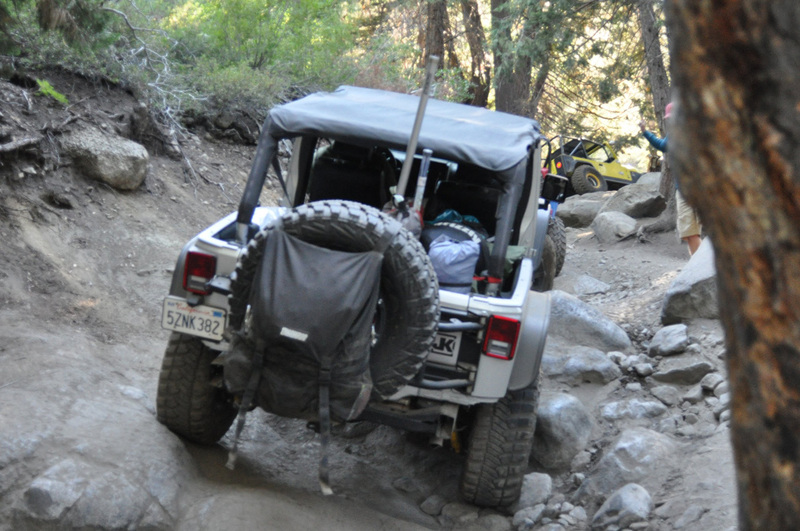 “I am turning too far left,” I told myself as my rig floated in two-wheel limbo, threatening to tumble down to the switchback below. Steering to the right corrected it, but brought me much closer to the edge, and to dropping down to the switchback below. Correcting for that, got me a little sideways, but I let off the gas and that fixed that. Note to self: First corner, stay left but not too far left. All of the advantages of having a roof-top tent on a trail like this were immediately erased. It will stay home next time, along with a lot of other stuff. The weight up high just makes the truck too top-heavy. After surviving my first mistake, I stopped for a bit since traffic was stacking up. So I got out of the rig and wandered ahead to survey trail and to talk with Josh, who had witnessed my circus act, and Caleb, who had photographed it. There was a lot of nervous laughter. “I’m glad you didn’t tip over,” was said more than once. Gulp. “Does this thing get any worse?” we all asked ourselves. Speaking to each other though, we didn’t verbalize our fear lest we confirm it. Once again, we were worried. We made it through the narrow stuff and up the steep stuff. 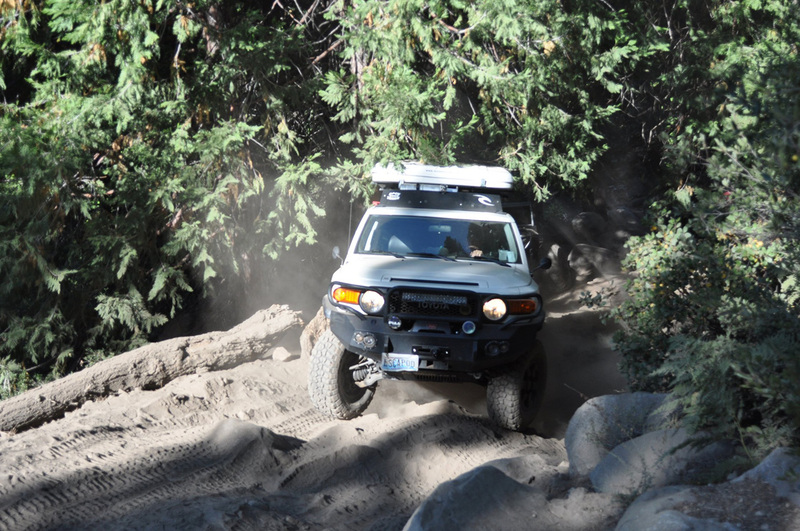 I had a couple of buggy drivers behind me who were hooting and cheering me on as I threw the FJ at whatever lay in its way. It was difficult to see at times. It was about 10:30 am and we were driving near, at, and beyond the angle the sun, so it was often in our eyes, right as we got near the top of an obstacle. My friends the Buggy Drivers. The rig in the background is also the one that passes in front of me in an earlier video shot at the beginning of the Big Sluice. Once the most intense stuff was over, I drove past Josh, who had just finished guiding us through a tough spot, and got ahead of him a little bit. Without thinking about it, my rear passenger-side wheel slid off a rock I wasn’t planted on squarely enough. Crunch! Just like that I had bounced off a tree. The result? Body damage. I knew it before I even looked at it. My forecast had come true. 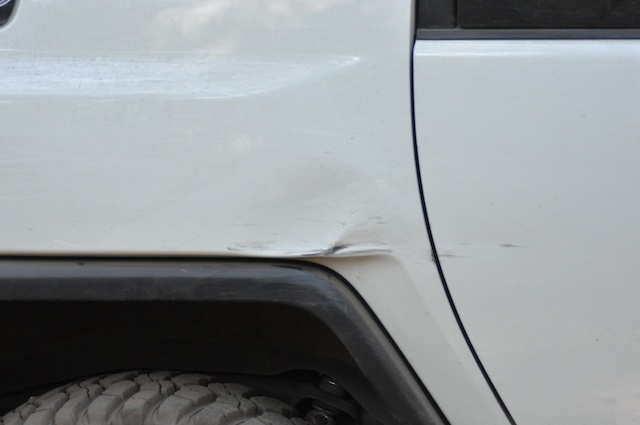 My words from years before, “I wouldn’t mind body damage from driving something like the Rubicon,” came right back to me. At that moment I didn’t mind as much as I thought I would, although the idea of running the Rubicon for the first time without body damage was over. That was more a pride thing than anything though. The most important thing was that we were safe, hadn’t broken anything—we never even had to rope up—and we had fun. Erik ran it clean. He did a great job. We continued on up to a left hand turn and another switchback. It still posed its puzzles: shelves to go up, and boulders and banks to squeeze around, but nothing like what we had gone through. We got held up for a bit by a Jeep with a fuel problem and met some more friendly people. 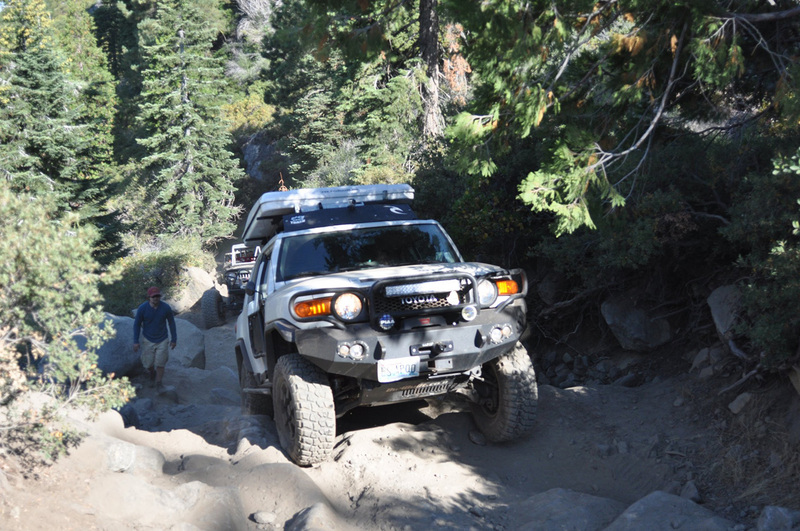 Friendly people are everywhere on the Rubicon. They help restore your faith in people. This group of guys tried to convince Erik that we should do a trail called Fordyce. I think I’d need a snorkel do it and am not sure I want to install one. Time will tell. 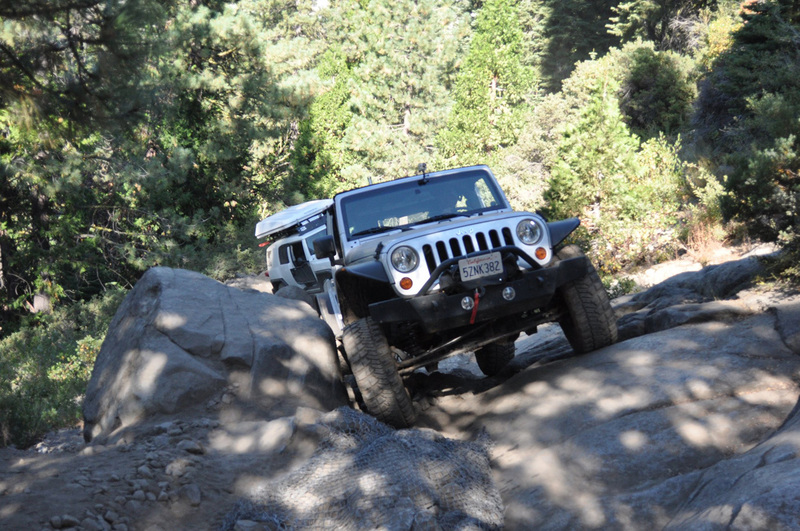 We had had an awesome time on the Rubicon Trail. We never argued once. In fact the stress brought us together. We were a team and we acted like one. We also laughed, and joked, and poked fun at each other, and had a great “family camping trip.” It just happened to be on a dirt road. 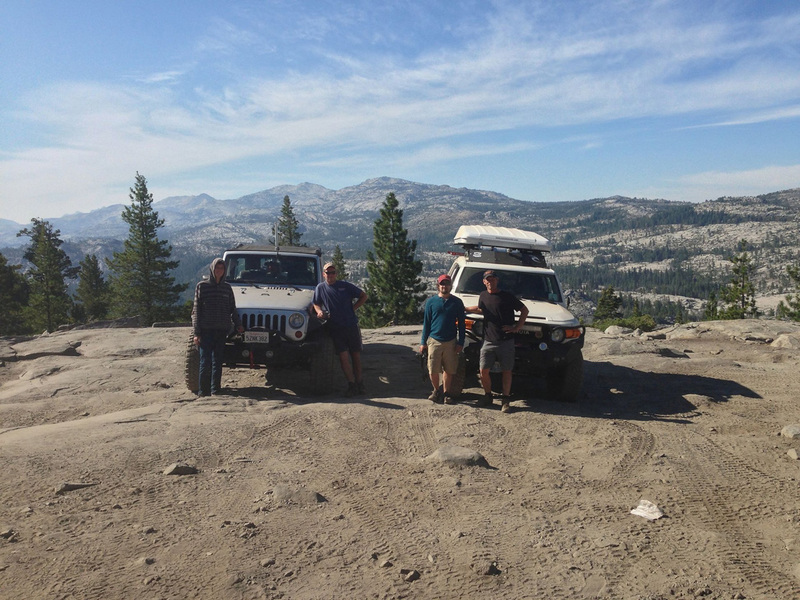 The Rubicon Trail passes over the right shoulder of the peaks in the background, making its way to the left to Buck Island Lake, and further left to Rubicon Springs. I don’t know what trail we’ll do next, but we’ve promised ourselves that we WILL do a trail next year. 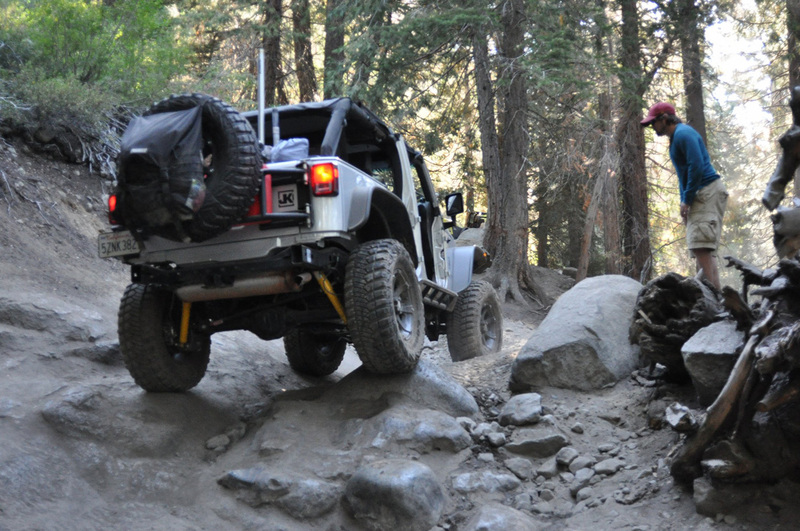 It probably won’t be the Rubicon, though we are planning to do it again, probably in 2015. By then I hope to have 315s and a little more suspension. I’d also like to bring my younger son Jake, and maybe an old friend, along for that run. Next time we’ll try the Little Sluice and we won’t be so scared—we’ll know what to expect. So that’s our story. 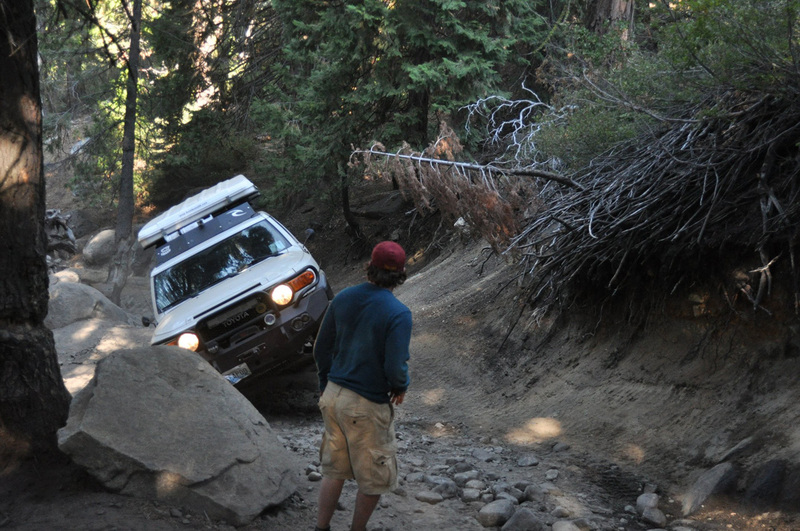 Josh drove all the way back from Observation Point to the staging area, a section that still isn’t very kind. This trail never gives up. He drove very well. We aired up at the staging area and said our goodbyes and went our separate ways. Josh and I stopped at the In & Out in Auburn and both had Double-Doubles (with sliced onion, chocolate shakes, and fries). He had his “animal-style,” whatever that is. We added up the calories, and they were a lot, a whole day’s count. We had earned it. I want to thank those of you who sent kind, encouraging replies to this thread [on the Expedition Portal forum]. They helped me know that I was on the right track, telling a story, and not just giving trail descriptions. Telling ones story seems presumptuous and hard to do. In a few days or so, I will follow up with “lesson’s learned” and adjustments that I will make in my trail preparation for the next time. I’ll also post any cool pictures I missed. Further out, I would like to edit a video of Cadillac Hill. We have two complete perspectives, but that takes lots of time. 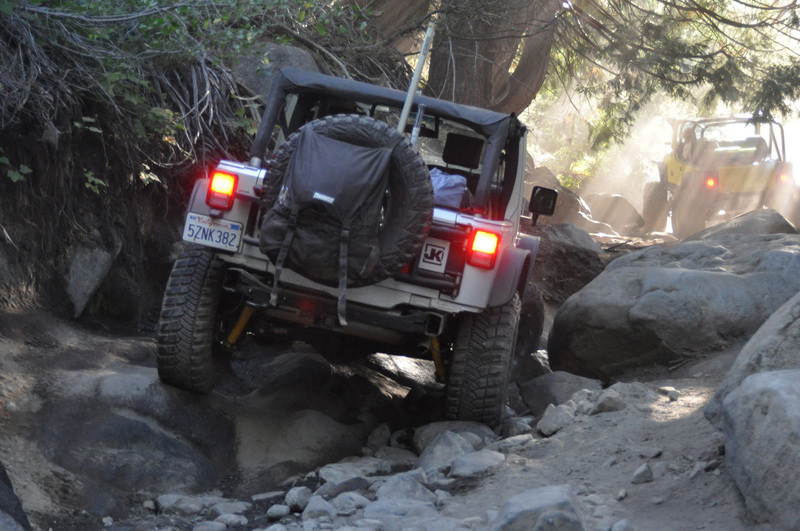 I know that the Rubicon is nothing like it used to be. If it were, I would never have made it in my vehicle. That said, I was happy that I was able to do it under the current conditions and still feel well challenged. I’m glad others, who are more capably equipped, still have fun too.